Summer, swimming, and snacking go hand-in-hand. When I am snacking in the summer I don’t want something heavy that will weigh me down, instead, I want something light and fresh. 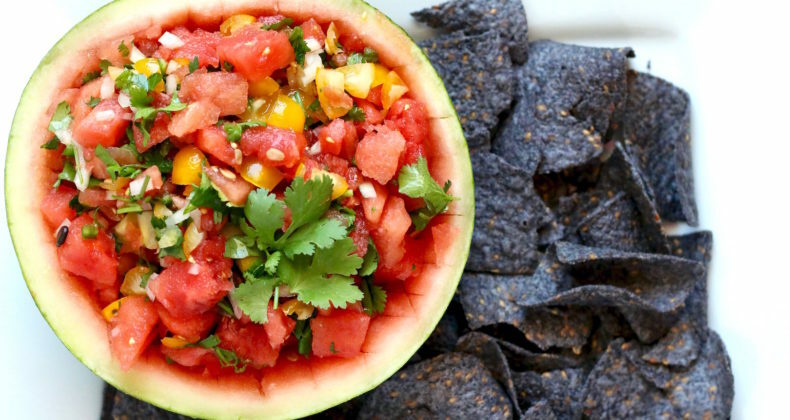 Fresh Watermelon Salsa tastes like summer on a chip. It is both sweet and spicy, cool and refreshing, and great with lemonade or a margarita. Everyone wins here. 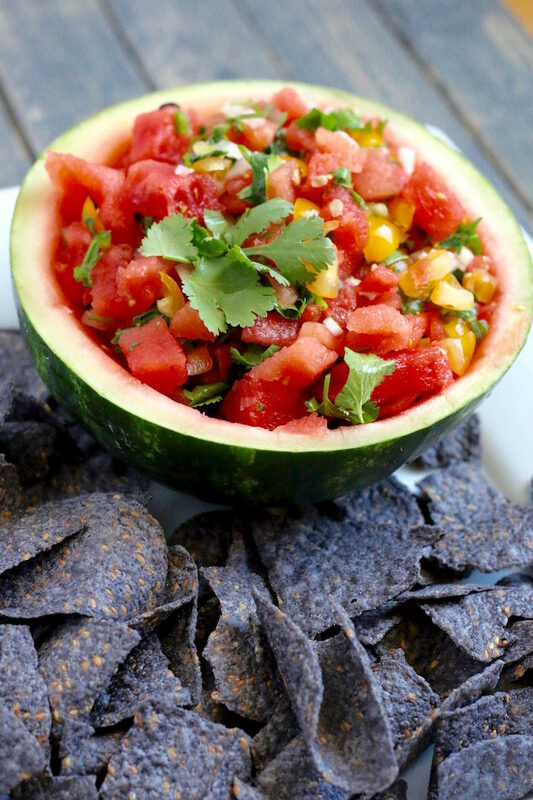 This recipe is a rework of an old watermelon salsa recipe I published five years ago. The salsa was so dang good I just wanted to publish the recipe and I wasn’t worried about a photo that reflected how good it was. I finally took the time to retake those photos and I think these to the salsa justice. This time around I opted to use super sweet golden tomatoes for a nice color variety and added flavor. I also subbed in serano peppers for the jalapeno since the jalapenos looked a little sad on the shelf. You can use which ever you have on hand or like to eat. At the store they had these beautiful mini watermelons and I just knew if I cut it in half it would make the perfect serving dish for my salsa. Even though I only used half of the watermelon I found I had enough “filling” to fill it twice. This would make a great party appetizer. Think Father’s Day barbecue or Fourth of July! What is your favorite summer appetizer? Cut the watermelon in half then cut across and up & down inserting your knife until it just reaches the rind. To remove the watermelon flesh run the knife around the outside of the flesh between the rind. In a medium size bowl toss together all ingredients.